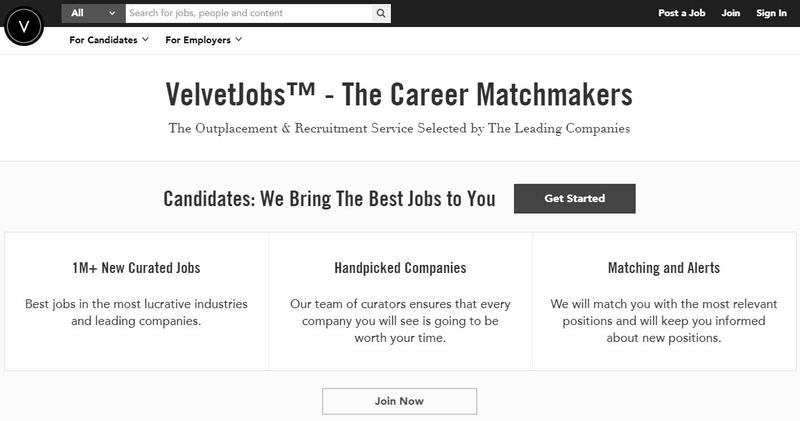 The creator of the website VelvetJobs.com calls the company ‘the career matchmakers’, which is a catchy phrase and exactly what such companies aim to achieve. However, in order to do it well, a company needs to provide customers with affordable prices, a wide range of services, strong guarantees, and many other benefits and features. To find out more about the service, we decided to take a closer look and write a VelvetJobs review. You would be surprised to hear that this is actually not a resume writing service. Yes, you can pay extra for some resume creation privileges, but basically, this is not a company that offers services.Their main service is to get you a job. As the name suggests, Velvet Jobs is a place where people can post jobs and apply for jobs, and the company’s income comes from the provision they charge for being ‘matchmakers’. You will find that the company mentions assistance from an expert, but this is nowhere to be found and the service is not available to purchase. Therefore, all you can get here is a free template, a place to post or find a job. Unfortunately, they don’t really have many job options available at this point. As other Velvet Jobs reviews suggest, the company does not seem to work very well. Considering that there are no services with this company, there are also no prices. The only expense you have in terms of resume writing is the additional fee you can pay to get some privileges in terms of resume creation. However, even if you pay these fees, you are still the one making your own resume.Posting a job here is also very easy, but the fees for matchmaking are a bit steep. Basically, this is not a service that writes your resumes but only provides you with templates. Also, it is not a service that helps you distribute a resume or find a job, but one that offers a list of available jobs posted by other people on the website. Therefore, you cannot really expect any discounts. The additional fees we mentioned are very low since they do not really come with high benefits, and you cannot be a regular customer here since the website does not really offer to do something for you. Seeing that there isn’t really a service you can purchase here, we cannot evaluate the quality of services of Velvet Jobs. What we can do is inform you of the usage of this website. If you take a look in their job posts, you will see that this isn’t a very popular website, since the postings are very few. In addition to this, their website is plainly designed and very confusing in terms of navigation. Even the resume creation process takes a lot of time and is a bit complex. Of course, there are no guarantees with this company. Since they have no services to offer or charge, they cannot really guarantee anything. When we saw that they mediate jobs between employers and employees, we expected some guarantees such as ‘guaranteed privacy’ or ‘guarantee for not sharing your resume with anyone’, but there was none. Therefore, if you create your resume at VelvetJobs.com for free, they are not obliged to keep it confidential. When it comes to supporting, the contacting methods here make us wonder if this is a legit company or not. There isn’t an address, phone number, or even live chat available for contact. The only way to get in touch with the company is through the website form, or the e-mail you will find in the Contact Us section.We tried both methods and got a reply in 48 hours, which makes for a bad customer support service. VelvetJobs.com has disappointed us in many ways. Firstly, we found out that they do not write your resumes, but actually charge you for creating it on your own. Secondly, they focus on job posts and applications, which means that you can only find a job on this website. However, they offer no guarantees or discounts and have a terrible customer support service. I wish I’d read this Velvet Jobs review. I certainly would not make the mistake I made and order from the service. They do have a nice policy of rewriting the existing resume, but my resume is bad beyond repair. VelvetJobs.com is a disaster! I got an entire package here to save some money, but I should have gone with a single resume. Every part of my package is bad, I don’t know which one to choose for a first revision!